Welcome to the premier issue of the Embedded Components and Tools forum. The embedded device marketplace is one of the most expensive markets for both manufacturers and their suppliers to participate. Dynamic market forces are pushing silicon to contain more intellectual property (IP) to lower production costs, shortening the delivery time to market, and requiring advanced features bundled into applications faster then their competitors. The Embedded Components and Tools forum understands this market pressure and has a vision to help through what it calls Cycles of Efficiency™. The forum is a new resource for both the engineers involved in the design and manufacture of devices, and the sales teams who offer potential cost effective component and tool solutions. Let us know what new information you would like to read about in future issues. It's a cost-cutting solution for embedded engineers. It's also a breakthrough promotional device for sales teams offering reusable assets such as embedded components and development tools. Developing real-time embedded software is a specialty that requires knowledge of both embedded system design and timing constraints imposed by physical limitations of the hardware. The target audience for this presentation includes safety critical and mission critical embedded device designers and developers. This presentation's content will be equally useful to hardware designers who wish to utilize existing hardware more effectively and to software developers who wish to pack more features into their resource constrained embedded applications. Another key sign that it is time to review this presentation is when you might mistakenly wish your priority-based preemptive real-time scheduler could be redesigned to improve software performance - use RMA to avoid redesign. 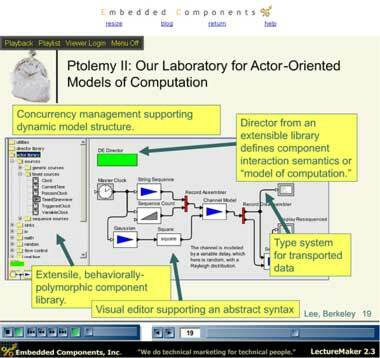 This lecture targets the embedded system developer, tools engineer, and researcher who needs to understand the current problems, current solutions, and future trends, in creating real-time systems. The viewer is introduced to the real-time dichotomy between the tools for hardware design and software design. This lecture targets the embedded system developer, network engineer, and OEM device architect. and how to migrate your existing application code from proprietary network data sharing (or no data sharing) to the CIFS open standard. Tom is the author of several books based on his vast executive experience within the IT industry. 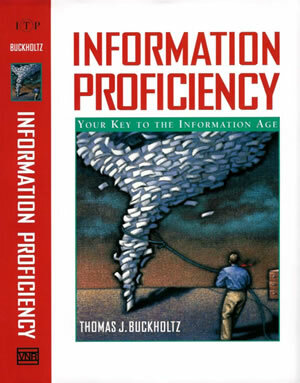 His first book, Information Proficiency, provides vital perspective, frameworks, tools, and success stories for setting and achieving worthy goals, measuring and improving decision making, developing and using information effectively, deploying information systems, and acquiring, developing, or selling technologies. 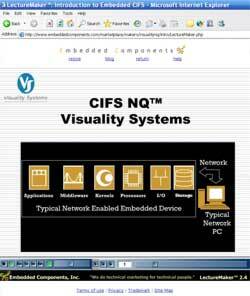 © Copyright 2006, Embedded Components, Inc.